Make no mistake about it, when the zombies rise and attempt to devour humanity, you're going to want a good, quality weapon at your side. And there's no better place to look for one than in the Real Weapons section of the Zombies Playground. Trust us when we say that these weapons are no friend to zombie-kind, and having one used against you is no picnic, either. Everything you'll find here in this category, be it knife, axe, machete, or anything else, is a functional weapon, in one way or another. Every one of the axes you'll find here are working blades that will cut through wood as cleanly as they will through zombies. Every knife is a functional tool made for either survival or combat (or both). Every machete is either sharpened, or has a blade that will hold a good, cutting edge. 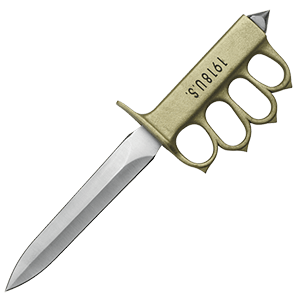 Everything in this real weapons category is made for the rigors of use and survival, which means that they pack a mean punch when used for battle, as well. Many, if not all, of these weapons are made from quality steel and utilize strong materials in their construction, all to ensure that these weapons and tools will last no matter how much punishment they take (please note that every tool and weapon needs to be cared for and maintained from time to time). And of course, the final advantage to any of our Real Weapons is that close-combat weapons don't need to be reloaded, which means you can keep swinging until your arm gets tired. Still don't think zombies are a threat? Well, that's your business and your choice, but that does not mean that you still can't benefit from picking up one of these Real Weapons from the Zombies Playground. You might never kill a zombie with it, but it will still be a rugged and effective tool and weapon that will serve for many years to come. There is a reason why the axe is a top-tier zombie killer when it comes to weapons. And no matter its size, you can rest assured that every Real Axe and Hatchet that you get from the Zombies Playground is a rugged and reliable tool and weapon that can be used just as easily for battle as it can for survival. But why, exactly, is the axe such a wonderful tool when it comes to survival? And what makes it appropriate for zombie-slaying? Axes can be used for cutting, carving, and shaping wood, and when it comes to survival, crafting and fending for yourself are key concepts. The axe shines as a zombie slayer thanks to a combination of mass and force, as the heavy, weighted head with a wide swing makes decapitations easier, and even an errant swing can crumple a zombie by shear force and momentum alone. Of course axes come in all shapes and sizes, and you'll find many of them here. 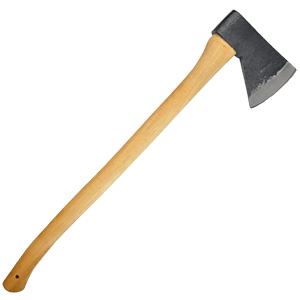 Survival axes, tomahawks, hatchets, and cruiser axes are smaller and perfect for traveling, especially when loads and packs need to be light, whereas wood axes are full-sized axes that are perfect for felling trees and zombies alike. Each of the axes featured here at the Zombies Playground are made from quality materials, including high-grade steel and other metals to ensure that they will perform reliably for many years, so long as they are properly maintained. Whether its zombies, disaster, or even personal preference that encourages you to abandon civilization for the wilderness (even for a short time), you couldn't ask for more than one of these Real Axes and Hatchets to be hanging at your side, ready and waiting for any sort of use. No-one really wants to get up-close and personal with a zombie, but it does happen. And when it does, it is far better to be equipped a blade from the Zombie Playground's Real Knives and Daggers section, so that you know your knife will stand up the rigors of battle. Each of these knives has been crafted and made with survival in mind, which means that each knife you see here in this category is a rugged and rough blade that is made to last. And don't think for a second that "knife" and "dagger" indicates that every blade you see here is short, because that is the farthest thing from the truth. In this category, you will find short little survival knives that are perfect for a variety of camping and survival tasks, the least of which is likely keeping you safe from a zombie. You'll also, however, find larger knives that are more suited for use in combat, like the bolo knives from the Philippines, the infamous kukri blades of Nepalese origin, and the bowie knives of American design. The only thing you'll find in common between these knives is the strength of construction, in that every blade here, big and small, is made to withstand use (please note that all knives, survival and combat, need regular maintenance, whether used or not). There's absolutely no reason to not carry a blade from the Zombie Playground's Real Knives and Daggers Section, especially when you consider how effective and useful even the smallest of these blades can really be. The machete is basically a modern-day sword, featuring a long blade that is designed for cutting. 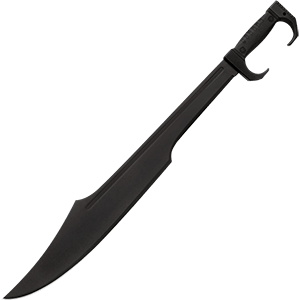 At the Zombies Playground, we feel that it is this simple approach that makes the machete one of the finer zombie killing weapons on the market, which is why we offer a number of them in our Real Machetes category. Of course, the machete makes for an outstanding tool when clearing away brush or cutting down vegetation, but why, exactly, is it such a great anti-zombie weapon? For starters, the machete's longer length allows for a kill to be made from further away, while its longer blade makes cutting so much easier than, say, an axe with its much smaller edge. 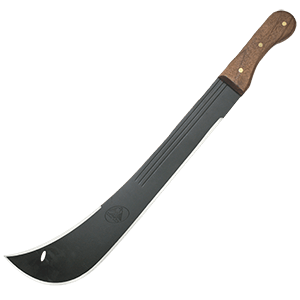 Of further benefit is the fact that machetes are easy to carry, easy to maintain, and easy to use, which are all things that a zombie-survivor would want in a weapon. We carry a variety of different machetes with varying blade styles and finishes, ranging from machetes with heavy, chopping blades to thinner, more nimble machetes that possess both reach and grace. Each and every one of our machetes is made for survival, which means that they're made from quality materials that are designed and tested to withstand the rigors of use (please note that every machete needs to be cared for and maintained, whether used against zombies, used against plants, or not used at all). Of course, the visceral aspect of the machete, getting in close and felling your foes with your own hands, is also rather appealing on some level. So the next time you feel that a zombie outbreak is imminent, make sure you have one of our Real Machetes close at-hand so that you can swiftly and efficiently deal with any zombie threats you might encounter. With a steady hand and a little bit of practice, any one of the Real Throwing Weapons found at the Zombies Playground could be transformed into a lethal missile capable of piercing a zombie's skull and ending its miserable, undead existence, and all without risking life or limb at a closer range. Exceptionally well-balanced, each of these throwing knives is made so that its center of balance is situated closer to the tip, ensuring that when thrown, the blade is predisposed to land point first. A typical throwing knife is usually made from a single piece of metal, and many of these throwing knives do not differ from this trend. 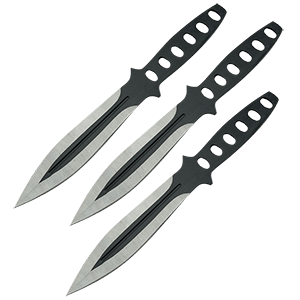 Each of these throwing knives features a simple handle on one end for balance and effective gripping, as well as a razor-sharp point on the other end that will effectively slice through a variety of materials when thrown, including zombie flesh. There's no greater feeling of delivering one of these Real Throwing Weapons into the skull of a zombie and watching the undead horror hit the ground, never to move again. And of course, one final benefit to using throwing weapons effectively is that under good circumstances, you can also retrieve the thrown projectile and use it again and again, on every zombie you encounter! Of all the non-firearm projectile weapons to arm yourself with during the zombie apocalypse, slingshots make one of your best choices. Zombies Playground provides a selection of high quality slingshots to use when the zombies attack. With their ease of use and accuracy, survival slingshots like these will quickly become your weapon of choice. Many of our adjustable slingshots possess wrist supports that can be fine-tuned for comfort and stability, while the slingshot yokes can be modified for different draw lengths. The band of these slingshots helps your shot reach a high velocity for a significant impact on the target. 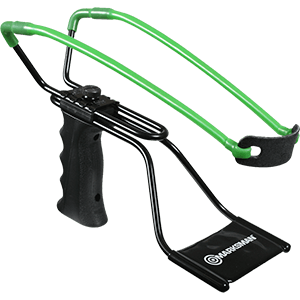 These slingshots can catapult marbles and steel shot, and we offer additional hunting shot for when you are running low on ammo. Check out these fantastic survival tools to find the right one for your needs! You might be wondering why, exactly, a shovel belongs in the category of "Real Weapons". Well, here at Zombies Playground, we can assure you that our Survival Shovels are, indeed, real weapons that are fully capable of ending a zombie's life in a rather brutal, yet quick and efficient manner. Blunt force trauma to a zombie's skull is actually as effective as removing its head altogether, it seems. Each and every one of these shovels is made from quality materials of the sort that combat knives, axes, and machetes are typically made from. The end result is a truly impressive and highly durable shovel that can be reliably used for digging trenches and other defenses, as well as for bashing, prying, and even making crude cuts with the tip of the shovel's blade. Some of these shovels are even convertible tools, shifting their form into different shapes to fulfill a variety of different tasks and making them that much more effective at both survival tasks and killing zombies. Some people might think that a shovel is among the worst weapons to use whenever killing zombies, but that's just not true. 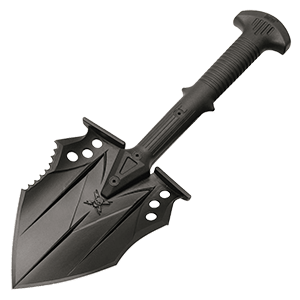 Granted, it might not be an ideal weapon, but any one of our Survival Shovels is nothing if not rugged and effective, both in tasks required of wilderness survival and in tasks required of zombie slaying. What defines an unconventional weapon? In this instance, we at Zombies Playground define an unconventional weapon as one you wouldn't initially pick, but one that nevertheless is still as effective at killing zombies as, say, a razor-sharp blade. And each of these weapons definitely qualifies under that criterion. In this category, you'll find weapons that wouldn't necessarily seem like effective zombie killers. But you can rest assured that if you can find it here, it's definitely up to the task of taking on more than a few zombies. 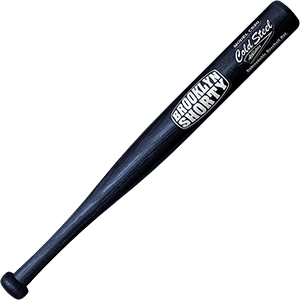 Here, you'll find weapons like baseball bats, which are perfect for not only smashing a pitch out of the ballpark, but also well-suited to pulverizing a zombie skull into little more than a messy stain. And that's not all you'll find here. As time goes by and we destroy more and more zombies, we'll add more items to this category, ensuring that each and every one is an effective zombie slayer in its own right. And even better, most of the time, an unconventional weapon, like a survival knife, is something of a multi-tasker, capable of filling many different roles. So check back with the Zombies Playground every now and then, so that you can keep yourself up-to-date with what some of the best Unconventional Weapons are when it comes to surviving the zombie apocalypse.